Hi!! I am Marci from Suzy Social Worker by day Betty Crocker by Night. 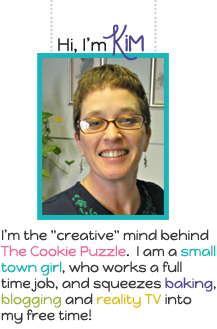 I am so flattered and honored to have been asked to participate in The Cookie Puzzle’s Autism Awareness Month. I have read through some amazing posts. Some have even made me cry. I have known about Autism for a while, but from a different point of view. I am a social worker and formally was a therapist. I may not be able to quote statistics to you about Autism, but I can tell you that I have learned a lot just by being a part of these families lives for a short period of time. I remember when I worked with my very first client- a young boy- with Autism. He had an Autism spectrum disorder called Asperger’s. He was not what I had expected. I was a young clinician- just starting my career in mental health as a community based therapist. I wish I could claim that I had a tremendous impact on this young man, but I cannot. I do know that I learned a great deal from him and continued to learn a great deal from other clients with Autism throughout the years. Some of the most challenging experiences I had as a therapist were with children with Autism, but they were also some of the most rewarding experiences ever. I continued to work in the mental health arena for over a decade. In that time, I learned a great deal about Autism. I also learned that I really don’t know that much at all about Autism. Every child is different, every family is different and as a therapist I always had to think creatively. I remember with one family I worked with- I always say family because even though the child was my client- I truly worked with the whole family. I worked with Mom to come up with a behavior plan and also worked on flashcards to use with the client. I thought that I was being so creative and original. Little did I know that flashcards and “cue” cards can be an important component of Autism therapy. Since working with that family, I have learned much more about the treatment approaches. I am not a trained therapist in any behavioral approach for Autism. I worked with some clients throughout the years who have had Autism spectrum disorders. I am not an expert in Autism or the treatment of Autism. I have just been fortunate enough to experience how special they truly are in my behavioral health work. I really tried to think creatively about doing an Autism Awareness Post. I had thought about doing a cookie puzzle piece cookie, but decided that I would be a rebel and do something different. So, instead I made cookie flashcards. Flashcards can be a component of therapy or treatment with a child with Autism, but I have learned that flashcards or “cue” cards can be an amazing tool with any kid. Cue cards can be incorporated into a chore chart. Cue cards can be placed on the mirror to remind a kid of the morning bathroom routine and cue cards can be used as visual reminder for many daily tasks and learning. Here are a few cue cards I made. Although, I no longer work in behavioral health I will never forget my memories from my clients and therapy. I know more about dinosaurs from one young boy I worked with than I ever thought that I would know. I also can say I held a hissing cockroach in my hand- just for one second- and a tarantula. That young boy loved insects and bugs and could recite amazing facts about them. And kudos to his Mom for allowing him to have a “pet” cockroach and tarantula. 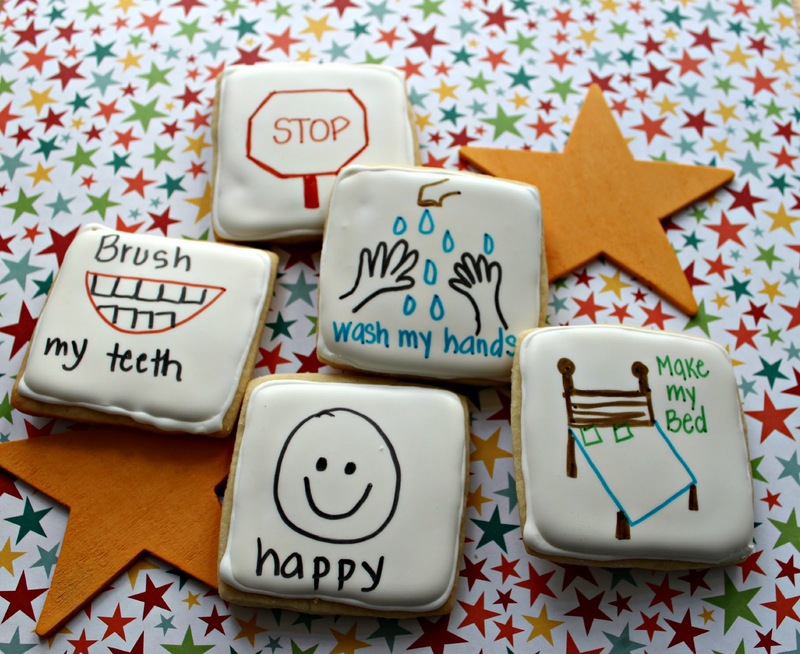 Since I made cookie Cue cards I also made a few more cookies. They are simple- but sometimes simple is ok. 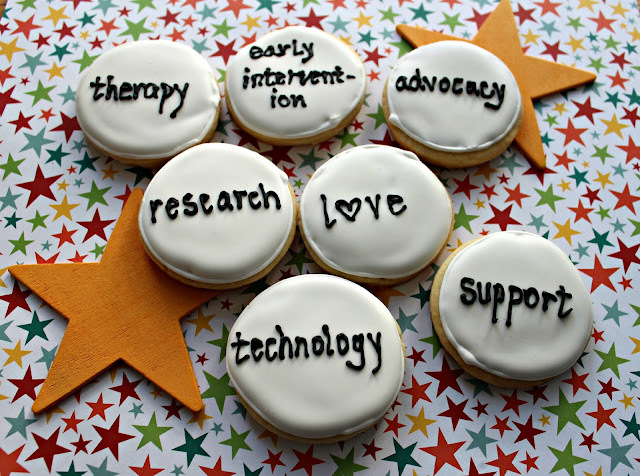 I chose just a few key words to place on cookies that can impact a child or family’s experience with Autism. We can all help out in one of these areas. We may love a child with Autism. We may work on research for Autism. We may advocate for Autism. We may work on technology that impacts Autism. We may support a family with Autism. We may do therapy with a client with Autism. We can all do something. Thanks again Kim for allowing me to participate in such an amazing project. It doesn't matter which kind of job do you have. You have to write a resume if you want to change it. I would suggest you start with the resume. If you have some ideas about it, write it down. If you have no ideas about it, think about the new job properly. Anyway, here is one of the best writing resource. Take o look at resume prime. Guys from that service could help you with your resume. And it quite a good start.